Pool Safety Tip: No Phones Allowed! It’s so easy for us as parents and guardians to become distracted by our smartphones. But even those few seconds looking away from the pool to check a notification could be deadly. If you absolutely must have your phone nearby, keep a strict “hands off!” policy for yourself and only answer it when absolutely necessary. You may even want to make sure kids get out of the water while your attention is elsewhere. One of the least considered potential springtime pool safety hazards is long hair. Long hair can pose a serious threat to the safety of children and adults alike as it can become entrapped and entangled in drains, pipes, or anything else that may be in or on the pool. If you or a child has long hair, tie it up securely prior to him or her entering the pool. If you hear any thunder or see lightning off in the distance, take that as a warning to get up and out of the pool. Water attracts lightning and acts as a conductor for electricity, so you could be in serious danger of electrocution. Storms can come up fast or even develop in your vicinity and give you little warning. It’s always better to take a “safety first” approach and when in doubt, get out. Here in Houston, the blistering UV rays from the sun can begin to damage the skin within a few mere minutes. Sun safety for kids and adults is just as important as water safety, particularly with skin cancer being on the rise. Take the time to choose a high quality sun block and apply it to yourself and your kids 30 minutes prior to going out and enjoying the pool (this ensures that the sunscreen has had time to be absorbed into the skin so it won’t come off in the pool). Here’s another great tip for sun safety for kids: swimsuits with SPF built right into the material! A number of bathing suits are now made with a built in SPF of 30 or higher. Also, always try to encourage children to wear t-shirts (and if they’re SPF shirts, all the better!) when in the pool. The last of our springtime pool safety tips is to always have a fully-stocked first aid kit near the pool (and make doubly sure it’s fully-stocked!). Time is of the essence when an injury occurs. This can help take care of minor injuries and prevent the worsening of a major one. 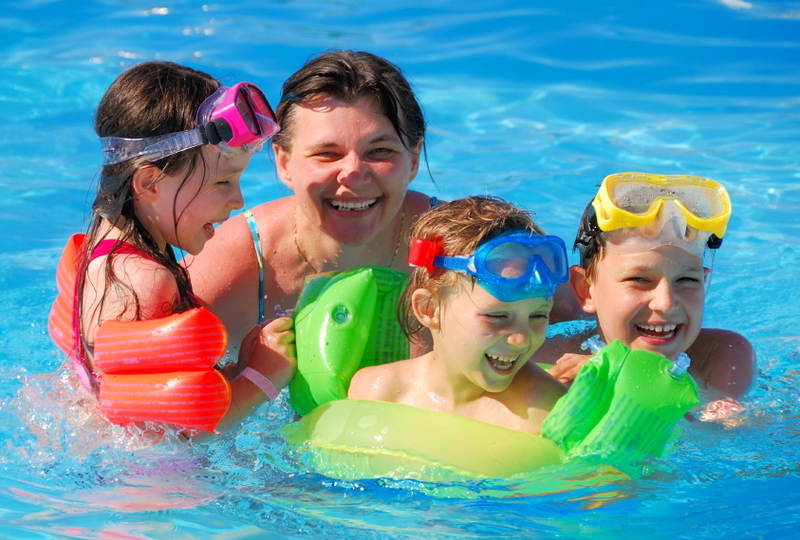 Owning a swimming pool is one of the greatest sources of fun, relaxation, and family bonding possible. Just by following a few safety tips, you can make sure it stays that way. It’s easy to take things for granted and let your guard down, but when it comes to pool safety it’s always better to be too careful.